We're obsessed with festivals, just like you. As fellow festival lovers, we want to help you discover the enchanting world of festivals without breaking the bank, as well as connect with a global community of fellow festival lovers. Whether you're the music festival type who loves seeing your favorite artists on larger-than-life stages, or more of a food festival kind of person who prefers chowing down on exquisite culinary delights from around the world, there is a festival for everyone on Everfest – and we want to help you get there. As festival-goers, we've made it our mission to partner with premier festivals to provide you with enhanced experiences and exclusive deals. If you aren’t an Everfest Premium member yet, what are you waiting for? Sign up here for as low as $3.99/month. Scroll through all the incredible deals coming up this month and check out even more here. Hip-hop is a loaded term: It’s a genre, a culture, a style of dance, and a lifestyle all wrapped into one. Hip-hop is more than an organized collection of dope beats and gnarly lyrics. The cultural aspect comes alive through A3C’s jam-packed conference schedule. Here, hip-hop shows its entrepreneurial side and takes you on a journey from rhymes scribbled in a notebook to full-blown artistry. Stick around for the festival aspect to listen to and get up close to some of hip-hop’s hottest artists. Get 99% off your Festival Pass with Everfest Premium. Joshua Tree National Park: remarkable, magical, and home to those eponymous and quirky-looking Joshua trees. Creating an incredibly intimate vibe, attendees continually invite their friends and family to the next gathering leading to only about 4,000 attendees. This festival has a beautifully inclusive atmosphere, creating a space that fosters positive growth and meaningful experiences. Along with the music and art, Joshua Tree Music Festival hosts numerous workshops and classes. Learn how to balance your chakras, immerse yourself in a sound bath, or participate in a guided meditation session at the Positive Vibration Station. Get 75% off your Car Camping Pass with Everfest Premium. The real world is chock-full of toxic vibes aiming to bring you down. If you want to escape the onslaught of negativity, head to the beautiful, cozy campgrounds of Salt River Acres in Shepherd, Michigan, for the annual Sacred Vibrations Music and Arts Festival. Beginning in 2017, Sacred Vibrations set out to provide an intimate experience where people can let their imaginations run wild in a positive environment. As a member of the Sacred Family, you can expect nothing but good vibes on the woodsy property while you enjoy a stacked lineup of music acts, flow performances, art installations and much more. Get 99% off your GA Weekend Pass with Everfest Premium. Or get 10% off all ticketing types with code ‘Everfest10’ at checkout. Mempho Music Festival is stacked with insanely talented artists who know how to get a crowd going. You’ll get down to the funkiest of rhythms all around the beautiful Shelby Farms Park, one of the largest urban parks in the country, where you’ll come across multiple live music stages and more than 20 bodies of water. Whether indie rock, hip-hop, funk, soul or the smooth Memphis blues are your jam, there’s something for everyone. Even better, you’ll be treated to authentic Memphis flavor from a huge lineup of local legends performing your favorite hometown get-downs. Get 2-Day VIP + Free Poster for the price of GA with Everfest Premium. Light the Night offers tons of festival fun throughout the year in the form of themed events including Wolf Run, the Sky Lantern Festival and the Water Lantern Festival. While each event features live music performances, fun-filled games and food and merchandise vendors, they each offer their own delightful experiences. The Muffuletta Festival in Metairie, Louisiana, will give you the lowdown on the mouth-watering creation along with a fun-filled day of celebrating Italian-American culture. Do yourself a favor and come to the festival hungry, because you’ll stumble across a delicious variety of food vendors serving traditional and modern takes on all kinds of Italian specialties. When you’re not stuffing your gullet, the festival is jam-packed with activities for the whole family to enjoy. Get a FREE VIP Pass with Everfest Premium. While the festival stretches into the cool weather of November, we’re kicking off the season the only way we know how—dressed in medieval garb and gorging on turkey legs and frothed goods, of course. A defunct 55-acre strip-mining site in Texas may seem odd stomping grounds for noble lords and corseted ladies, fortune-tellers and wenches, but each year that is exactly the scene when the largest Renaissance festival in the United States enlivens the “New Market Village” for eight autumn weekends in the town of Todd Mission. Over a half-million attendees—many of them costumed—create an alternate world with theatrics, jousting, archery, juggling, libations, and games like Drench-a-Wench. As a movie buff, you crave something original – something made with undeniable passion. That is why you should mix up your usual routine at the local movie theater and visit the San Diego International Film Festival (SDiFF). From extraordinary independent film screenings to world premieres and glamorous parties, SDiFF offers a unique film-going experience that will make you fall in love with movies again. Get up to $150 off Tickets and more with Everfest Premium. Having just celebrated its sixth anniversary, this Food Network and Food & Wine Magazine sponsored event uses one of the world’s greatest foodie cities as the backdrop for this charitable event. With more than 100 events, culinary heavy-hitters from around the globe and celebrity chefs from Food Network gather to serve up delicious dishes for a good cause—upwards of $1 million towards charity. Get 10% off Coca-Cola Backyard BBQ GA Tickets with code ‘Everfest18’ at checkout. Film Fest Tucson, an independent, homegrown experience for film buffs and casual movie-goers alike enjoy. Film Fest Tucson is the Old Pueblo’s destination festival, inviting locals and passionate movie-lovers to explore and discover captivating stories told on the silver screen. The weekend is jam-packed with dozens of compelling short and feature-length films from both emerging and established filmmakers at a multitude of iconic venues throughout the city. Crescent City Blues & BBQ Festival in October whose bluesy riffs and smoky ‘cues will have you salivating well before you arrive at Lafayette Square. Best of all, the muggy NOLA weather is almost nonexistent this time of year, and general admission is free of charge. However, get the VIP experience and enjoy complimentary food, drink, and more. Known as “America’s Polo Match!”, this unique traveling festival takes place all over the United States, visiting everywhere from New York City all the way to Austin, Texas, with each event sporting its own theme. In case you don’t know what polo is, it’s an action-packed team sport where opposing teams try to score goals against each other on horseback. There’s also huge range of activities for guests and their families to enjoy, ranging from savory wine tastings, exquisite farm-to-table dinners, a Battle of the Chefs Tasting Competition, hot air balloon launches and much more. You can also groove to an outstanding lineup of jazz bands, country artists and many other toe-tapping acts from around the country. Get 90% off General Admission and more with Everfest Premium. There’s no such thing as a practice run in the zombie apocalypse, so you’ll want to be in tip-top shape before the inevitable happens. You won’t get disemboweled if you start your training early at Zombie Charge, a fun-as-hell 5K run that pits survivors against the infected in a series of muddy obstacles. This thrilling fun run is your ticket to preparing for the deadly virus that will eventually wipe out all of humanity – except you! Spilling into the streets of downtown Denver, the Mile High Spirits Block Party brings a wicked lineup of electronic, trap and pop artists across two separate stages to kick off the fall season. As the night rages on and you tire yourself out from dancing, you can snack on delicious food from local food trucks, all of which will pair nicely with a fresh cocktail from the distillery. You can also marvel at vibrant art installations and visit the craft village to sift through local treasures. Whatever you do, prepare to boogie and spread positive vibes well past sundown with your favorite local distillery in the Mile High City. Get a FREE GA Ticket with Everfest Premium. Art is a universal language that connects people around the globe. The Bayou City Art Festival in Houston, Texas produced by the Art Colony Association, Inc., a non-profit organization, boasts a stunning display of modern artwork in the downtown area. It showcases exceptional talent while raising money for local non-profits at the same time. If you want to be dazzled no matter which way you look, this festival is for you. Get 99% off your 2-Day Pass with Everfest Premium. You can’t afford to splurge on a plane ticket to the Korean peninsula, but you don’t need to, because you can get your fix for authentic Korean culture at Discovery Green Park in Houston, Texas. The Korean-American Society of Houston created Korean Festival Houston in 2008 to bring the local Korean-American community and the Houston community together to enjoy a fun-filled day of culture. Drawing in tens of thousands of people from all over, the festival is still going strong and shows no signs of slowing down, offering live music entertainment, authentic cuisine and many other exciting activities throughout the day. Get 20 Free Food Tickets and a Parking Voucher with Everfest Premium. New Orleans is a hot spot for live music, cajun cooking and cultural vibrancy, but it also boasts a rich and extensive history in film. Look no further than the world-renowned New Orleans Film Festival to get your fix for high-quality filmmaking in multiple venues throughout the city. Curated by the esteemed New Orleans Film Society since 1989, this eight-day cinematic journey showcases over 200 films from around the world, and was named as one of “The 25 Coolest Film Festivals in the World” by Moviemaker Magazine. Get FREE Tickets and more with Everfest Premium. Based in Austin, Texas, this high-speed event brings Formula 1 racing and extraordinary live music performances to Circuit of the Americas, the only purpose-built F1 track in the country. If that doesn’t rev your engine, then nothing will. If you don’t know anything about Formula 1 racing, it leaves NASCAR in the dust. As one of the fastest racing series in the world, you can expect cars going top speed around dangerously tight corners. Get a FREE Friday Turn 12 (Standing) Ticket with Everfest Premium. There’s nothing quite like lounging in a beach chair and listening to your favorite country music acts on a beautiful day. 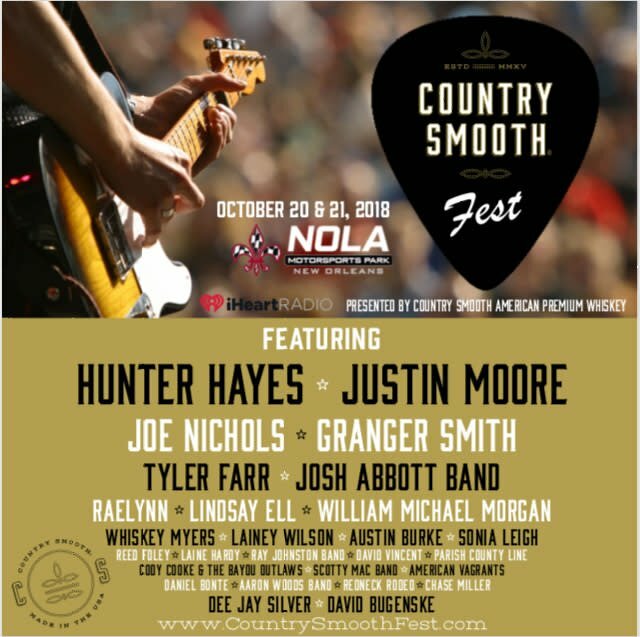 Country Smooth Fest offers a world-class lineup of country and Americana artists, which you can hear across three different stages throughout the weekend. Featuring both national stars and emerging acts, you’ll find a reason to tap your toes and dance your heart out no matter who’s playing. Get a FREE 2-Day VIP Pass with Everfest Premium. The Austin Film Festival gives a voice to hundreds of filmmakers and screenwriters with dedicated screenings, panel discussions, a screenwriting contest and lots of fun parties at numerous venues around town every fall. The fun doesn’t stop when the credits start rolling. Whether you’re a big-shot in the film industry, a starving artist or a casual observer with a ticket, you’re invited to attend a series of lively parties at various venues around town. Get a $175 Weekend Badge with Everfest Premium. Art Outside will blow your mind. Everywhere you look, a crazy kaleidoscope of colors whirls and mixes: LED lights from the music stages, painters spattering on group canvases, neon-glowing art installations. For the young, free-spirited attendees it's just what the doctor ordered. Two stages host more than 40 bands, spanning genres from reggae to funk to bluegrass, jam, glitch-hop, jazz, psychedelic and classic rock, from noon until sunrise. Get 50% off your 3-day GA pass with Everfest Premium.